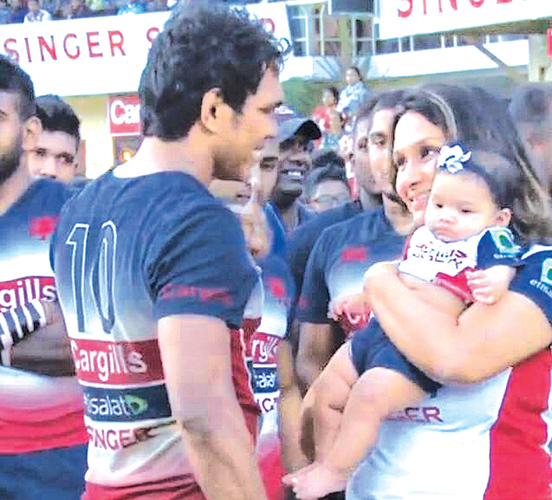 The Marija family – Faizal, Yasara and baby Liyara after the Kandy-Havelocks match at Nittawela on Saturday. All Kandy Sports Club rugby fans are sad that the mercurial and national fly half Fazil Marija has announced that he will retire from rugby after the Clifford Cup knockouts, and his last match at Nittawela grounds was played on Sunday. The deafening cry is for him to continue for at least another year. A player of his caliber and class is born only once in a lifetime and Kandy fans are upset that he has decided to quit when at the pinnacle of his glittering career. In the last game he scored three superb eye catching tries not easily seen at top class rugby. Highly popular Fazil enjoyed a 15-year career at the top level. He is a player who enjoyed every moment of being a top player and crowds were thrilled to watch his world class play, and are querying as to why he is going when there is more blood and determination in him. He has always been an example to the game and the country is lucky to have a ruggerite of his calibre who represented some great teams of Kandy Sports Club and Sri Lanka on his highly successful rugby road. He is now looking forward to starting the next chapter in his life by joining the coaching scrum. It is with huge sadness to every rugby lover to see Fazil Marija (born 2 December 1985), known as one of Sri Lanka’s finest rugby players and one of Asia’s best, play his last league game on Saturday. He was a man who was a big figure in the rugby field. He showed faith and trust for the game. He was the toughest ruggerite in the recent years, a brave player. In the last few years he had been the match-winner with his brilliant play had no equal in the game. Marija mastered his rugby skills at Kingswood College under his cousin Ronny Ibrahim’s guidance. H represented his school teams from U-13 to U-20. He played for 1st XV in 2003 as a fly half, and went on to lead them to an unbeaten triple championship in 2004 as the captain of Kingswood College 1st XV. Marija became the best Schoolboy player in the Singer International 7’s tournament and also in the Golden Key Schools 7’s tournament, where Kingswood College won both Championships under his captaincy. Two years back Fazil retired from national rugby, he played for the country for 14 years, considering that rugby is a rib bruising game it was admirable that he ran in amazing number of tries for club and country. His last game for Sri Lanka was in the final defeat to Malaysia at this year’s Asia Division I championship in Malaysia. He was easily the best rugby sevens and fifteen game player produced by the country in the last several years. Fazil is a player, leader, creator and altogether a fine example for all the rugby players. He is a ruggerite with plenty of ideas and ambition and certainly a knowledgeable player. Fazil’s capabilities and his potential cannot be matched by any of the fly half’s today. Fazil hails from a famous Malay sporting family, who are rugby crazy. He first represented Sri Lanka in year 2000. In that year he toured for the first time with Sri Lanka National U 16 team for the Junior Rugby Asiad. While still at school, in 2003 he was called up by Sri Lanka Rugby Football Union (SLRFU) to be on the starting lineup at the match against touring Hong Kong at Nittawela Rugby Stadium, Kandy. In 2004, Marija commenced his club rugby career by representing Kandy SC in their 2nd round match against Havelocks SC at Nittawela. He also went on to represent the Kandy SC in the Clifford Cup Knock out tournament matches the same year. To date, he continues to represent Kandy SC and during this period Kandy SC went onto dominate the sport by winning the League and Knockout tournaments continuously. He was adjudged ‘Most Promising Player of the Year 2004’ at the Caltex/Observer Rugby Awards. All this he achieved while he was still a schoolboy at Kingswood College. He captained Kandy SC in 2010. His father Abdul Rasheed Marija, was a sportsman and played for the Police. Mother Fareeda Sherifdeen participated in sports at Kandy Good Shepherd Convent. It was she who encouraged Fazil to take up to rugby. His uncles Tuany Amidon played football and rugby for Army and was an All-Ceylon football player and one of the best dribblers in Asia. Kamil “Roy” Amith played for Kandy S.C., T.M.N. Sherifdeen - Navy SC, Fazil’s cousins Ibrahim brothers Raja, Roy, Ronnie, Rinnie and Nilifer, Buks brothers Ansar and Amjad all played for Kandy SC, Dev Ananda played for Navy SC, his brother Faizal is with Kandy SC. Except for Tuany Amidon, the others are products of Kingswood College. Fazil as a schoolboy was spotted by Kandy SC’s godfather Malik Samarawickrema in the match between Kingswood and Royal, and was invited to play in the Clifford Cup knockouts and today he is a legend in the game. Forty minutes before the last league game against Havelocks at Nittawela on Sunday, a section of the tiers was named after him as Fazil Marija tiers. He married Yasara and are blessed with a baby Liyara.